to the coastal route N98 towards Sainte Maxime (12km). 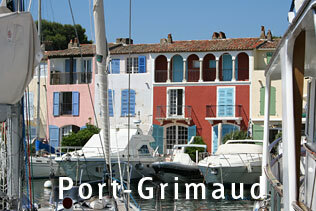 Nestled in the heart af the Maures Mountains and bordering the Gulf of St Tropez, Grimaud has maintained its medieval character. The village is very appealing with its paved and flowered streets winding about all the way from the Romanesque church to the ruins of the feudal castle. 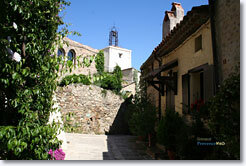 While exploring the village you will see beautiful old houses that have been superbly renovated. 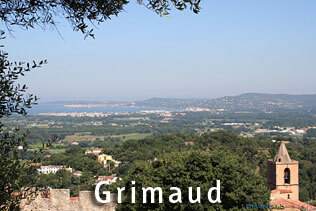 Grimaud sits on the hillside in the midst of fabulous views. 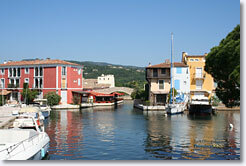 A few kilometers lower down on the coast, yau can visit Port Grimaud, a seaside vacation spot imagined by the architect François Spoerry. Thousands of visitors come to see this internationally renowned resort each year. 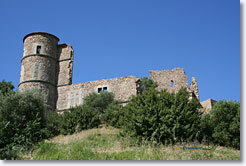 The ruins of the feudal castle. St. Michael's Church (11th.c.). The Fairy bridge. St. Roch Chapel. Water sports at the seaside.Bowling. Horseback riding. Golf course at Beauvallon (18 holes). Tennis, hiking. Airplane outings. Sailing. 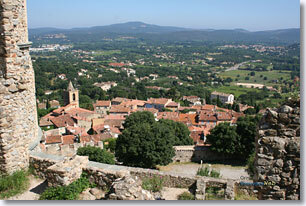 Gites, villas and apartments for rent. 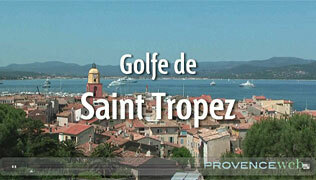 La Garde Freinand (10 km), Cogolin (3 km), Saint Tropez (10 km).